Slow breathing practices have been adopted in the modern world across the globe due to their claimed health benefits. This has piqued the interest of researchers and clinicians who have initiated investigations into the physiological (and psychological) effects of slow breathing techniques and attempted to uncover the underlying mechanisms. The aim of this article is to provide a comprehensive overview of normal respiratory physiology and the documented physiological effects of slow breathing techniques according to research in healthy humans. The review focuses on the physiological implications to the respiratory, cardiovascular, cardiorespiratory and autonomic nervous systems, with particular focus on diaphragm activity, ventilation efficiency, haemodynamics, heart rate variability, cardiorespiratory coupling, respiratory sinus arrhythmia and sympathovagal balance. The review ends with a brief discussion of the potential clinical implications of slow breathing techniques. This is a topic that warrants further research, understanding and discussion. Slow breathing practices have gained popularity in the western world due to their claimed health benefits, yet remain relatively untouched by the medical community. Investigations into the physiological effects of slow breathing have uncovered significant effects on the respiratory, cardiovascular, cardiorespiratory and autonomic nervous systems. Key findings include effects on respiratory muscle activity, ventilation efficiency, chemoreflex and baroreflex sensitivity, heart rate variability, blood flow dynamics, respiratory sinus arrhythmia, cardiorespiratory coupling, and sympathovagal balance. There appears to be potential for use of controlled slow breathing techniques as a means of optimising physiological parameters that appear to be associated with health and longevity, and that may extend to disease states; however, there is a dire need for further research into the area. To provide a comprehensive overview of normal human respiratory physiology and the documented effects of slow breathing in healthy humans. To review and discuss the evidence and hypotheses regarding the mechanisms underlying slow breathing physiological effects in humans. To provide a definition of slow breathing and what may constitute “autonomically optimised respiration”. To open discussion on the potential clinical implications of slow breathing techniques and the need for further research. The last decade has seen the emergence of literature documenting the effects and potential clinical benefits of slow breathing techniques, predominantly in disease states. The physiological effects of slow breathing in the healthy human, however, are yet to be comprehensively reviewed. Documented effects predominantly span the cardiovascular, autonomic, respiratory, endocrine and brain systems. The aim of this review is to provide a core definition of slow breathing, and summarise the major documented effects in healthy humans in order to form a knowledge base of the physiology and proposed mechanisms of slow breathing techniques upon which potential clinical applications can be discussed. The act of controlling one’s breath for the purpose of restoring or enhancing one’s health has been practiced for thousands of years amongst Eastern cultures. For example, yogic breathing (pranayama) is a well-known ancient practice of controlled breathing, often performed in conjunction with meditation or yoga, for its spiritual and perceived health-enhancing effects [1, 2]. Various forms of pranayama exist, such as nostril breathing (double, single or alternate), abdominal breathing, forceful breathing and vocalised (chanting) breathing, which are performed at varying rates and depths [1, 2]. Yoga, and hence pranayama, was first introduced to the West in the late 1800s and its popularity rose in the mid-1900s. Breathing techniques have since become increasingly popular due to a rising interest in holistic and wellness approaches to healthcare. Their claimed health benefits and potential to treat a range of medical conditions has piqued the interest of the medical and scientific communities, and stimulated research into the area. Since the 1990s, a system of breathing therapy developed within the Russian medical community by Konstantin Pavlovich Buteyko has made its way across several continents: the Buteyko method. K.P. Buteyko began treating patients with respiratory and circulatory diseases using breathing retraining in the 1950s and 1960s . Buteyko and other clinicians who adopted his methods claimed success in treating a wide range of chronic disorders, though it was some time before the method spread to other countries . Several clinical trials and Cochrane reviews have since investigated the effectiveness of the Buteyko method in the treatment of asthma, with more studies and consistent findings necessary in order to support reported promising results [5–10]. Our objective was to provide a comprehensive review for respirologists, physiologists, and clinicians and researchers outside of the field. The review focuses on the respiratory system, cardiovascular system, cardiorespiratory unit and autonomic nervous system. Each section begins with a brief overview of the physiology of that system during normal respiration, followed by discussion of the researched physiological effects of slow breathing in healthy humans. For the purpose of this review, we define slow breathing as any rate from 4 to 10 breaths per min (0.07–0.16 Hz). The typical respiratory rate in humans is within the range of 10–20 breaths per min (0.16–0.33 Hz). 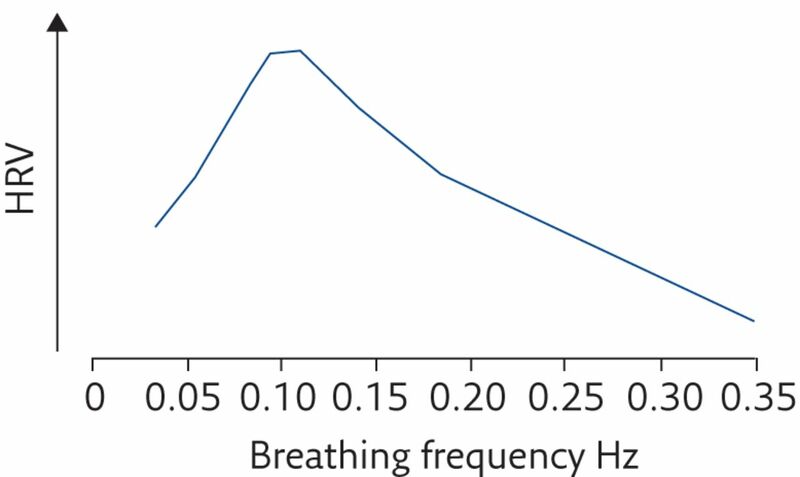 We initially performed a Medline search via PubMed for articles reviewing or reporting on the effects of breathing at 4–10 breaths per min or 0.07–0.16 Hz in humans. Investigations of breathing outside of this range were excluded, as were those that incorporated respiratory load, continuous positive airway pressure machines or other breathing apparatus, and/or other breathing techniques and/or meditation, yoga, tai chi, exercise or dietary interventions, and so forth. The Medline search expanded during the writing of the manuscript to incorporate literature pertaining to the normal physiology of the respiratory, cardiovascular, cardiorespiratory and autonomic nervous systems, and other topics relevant to the review. The term “tidal breathing” defines normal respiration with a relatively constant rate and inspiratory/expiratory volumes (tidal volume). Tidal breathing is driven by a group of primary and accessory inspiratory muscles collectively named the “respiratory pump”. The major respiratory muscle is the diaphragm, which, during normal inspiration, contracts and flattens, pushing on the abdomen, while the lower ribs are pushed upwards and outwards . Coordinated contraction of the diaphragm, external intercostals, parasternal, sternomastoid and scalene muscles results in expansion of the ribcage and rising of the chest [12, 13]. This generates a transdiaphragmatic pressure (increased abdominal pressure and decreased thoracic pressure) resulting in a decrease in intrathoracic/intrapleural pressure and subsequent ventilation of the lungs upon which pulmonary gas exchange occurs via the alveoli across the transpulmonary pressure gradient [13, 14]. Expiration is generally passive, with the diaphragm returning to its domed resting configuration, causing the lungs to deflate and expel air. When breathing effort is increased, however, the expiratory muscles become active; these include abdominal muscles which pull the abdominal wall inwards when contracted, forcing the diaphragm to rise superiorly into the ribcage and deflate the lungs . Studies of diaphragm movement and function claim that optimal respiration requires active control of the diaphragm, such that during inspiration, the lower ribs stay low and only expand laterally, while the abdomen expands instead of the chest . Analysis of diaphragm movement during tidal breathing and breath holding using magnetic resonance imaging (MRI) and spirometry has reported a correlation between the degree of movement of the diaphragm and changes in lung volume: the greater the difference in diaphragm movement between inspiration and expiration, the greater the tidal volume . Diaphragmatic breathing has also been shown to facilitate slow respiration. This was supported by a study in which healthy subjects trained in diaphragmatic breathing demonstrated slower respiratory rates and were more likely to achieve the study goal of 3–7 breaths per min than those subjects who breathed normally at a natural pace . Another investigation of the diaphragm using MRI found that slow breathing was associated with greater diaphragm excursion in healthy humans, compared to patients with a chronic spinal pathology, and concluded that correct and balanced diaphragm performance helps to maintain abdominal pressure and “smooth” respiration . The biomechanics of lung ventilation are carefully coordinated with blood oxygen, carbon dioxide and pH homeostasis. Minute ventilation is defined as respiratory rate multiplied by tidal volume; thus, to maintain minute ventilation, if respiratory rate is decreased, tidal volume must be increased. A decrease in respiratory rate alone would lead to hypercapnia and activation of chemoreceptors (predominantly central chemoreceptors located in the brain stem) that respond primarily by orchestrating a forced increase in respiration rate (hyperventilation) [19, 20]. Therefore, in order to maintain a decreased respiratory rate without disturbing respiratory homeostasis, tidal volume must be increased. Interestingly, it has been shown that controlled slow respiration at 6 breaths per min in healthy humans reduces the chemoreflex response to hypercapnia and hypoxia, compared with spontaneous respiration or controlled respiration at 15 breaths per min . Physiological dead space is the sum of anatomical dead space (air that does not reach the alveoli) and alveolar dead space (air that enters poorly or nonperfused alveoli); increasing respiratory rate does not improve ventilation efficiency because dead space is increased . Conversely, decreasing respiratory rate and increasing tidal volume has been shown to improve ventilation efficiency via alveolar recruitment and distension, thus reducing alveolar dead space . A study of the effect of breathing rate on oxygen saturation and exercise performance has confirmed this by measuring arterial oxygen saturation during spontaneous respiration and respiration at 15, 6 and 3 breaths per min, during rest and during exercise, in healthy subjects and in chronic heart failure patients . Slow respiration at 6 breaths per min was found to be optimal for improving alveolar ventilation and reducing dead space in both groups in terms of increased arterial oxygen saturation and ease and sustainability in terms of respiratory effort. Follow-up of patients with chronic heart failure who practiced slow breathing displayed increased exercise performance and motivation. The pumping of the heart and the flow of blood through the circulation are heavily influenced by various factors and events, such as oxygen demand, physical activity, stress, temperature and respiration . In a steady-state system, the effects that respiration has on the cardiovascular system may first be discussed in terms of haemodynamics. During normal inspiration, the pressure gradient between the right heart and the systemic circulation is increased due to the decrease in intrathoracic/intrapleural pressure being transferred to the right atrium, which results in an increase in venous return, filling of the right atrium and right ventricular stroke volume [26, 27]. Meanwhile, pulmonary resistance increases, pulmonary venous return is decreased and blood pools in the pulmonary capillaries, leading to a reduction in filling of the left heart [26, 28]. This increased storage of blood in the right heart and pulmonary circulation leads to an increase in cardiac output that occurs during the next intrinsic heartbeat. During expiration, these changes are reversed. The rate of respiration is known to affect haemodynamics. A study in which the arterial pulse (via heart rate and oscillometric arterial blood pressure) and peripheral resistance were analysed in healthy humans instructed to perform paced deep breathing at 20, 15, 10 and 6 breaths per min found that the rate of respiration affects the harmonics of the blood pressure pulse, which is related to the resistance of the peripheral vasculature, compliance of the aorta and hence venous return, such that slow respiration causes blood pulse fluctuations to synchronise with the heart beat rhythm . Slow breathing towards a rate of 6 breaths per min has been said to result in increased venous return . This is further augmented in diaphragmatic breathing due to the anatomical fact that the diaphragm is connected to and supports the heart, and provides passage for the aorta and the inferior vena cava . Studies in diaphragmatic breathers have reported increased efficiency of venous return, maximally during slow respiration, due to diaphragmatic excursion enhancing the collapsibility of the inferior vena cava that occurs during normal inspiration [32, 33]. A recent study has also found that coupling of respiration and vasomotion (oscillations in vascular tone (i.e. arteriole diameter), which causes oscillations in capillary blood flow) becomes apparent when respiration is slowed, and at around 6 breaths per min, significantly greater coupling occurred in subjects with low initial blood oxygenation . Speculation was made that vasomotion may become entrained and enhanced by slow respiration, particularly when there is room for improved blood oxygenation (i.e. tissue demands). These respiratory phase-driven fluctuations in venous filling, stroke volume, cardiac output and peripheral blood flow contribute to fluctuations in heart rate and blood pressure [35, 36]. Under steady-state conditions, increased venous return during inspiration equals increased cardiac output and an increased heart rate, which would also affect arterial blood pressure . It has long been known that the heart rate increases during inspiration while arterial blood pressure decreases, and vice versa during expiration . While changes in the cardiovascular system can induce changes in respiration, the influence that respiration has on the cardiovascular system is reportedly stronger [25, 29, 30, 39, 40]. Studies in healthy humans have found that controlled slow breathing, particularly at 6 breaths per min, is associated with an increase in fluctuations of both blood pressure and heart rate, compared to breathing at a typical rate [21, 41, 42]. Some hypothesise that this reflects a buffering of respiratory-related haemodynamic fluctuations due to synchronisation of the pulsating blood flow to the rhythm of the heartbeat [29, 41]. Several studies have also reported significantly decreased mean blood pressure during controlled slow respiration, which would support this hypothesis [30, 41, 43, 44]. Studies in humans breathing at 6 breaths per min have also reported a tendency for heartbeats to cluster within the inspiratory phase [45–48]. Relationships between heart rate, blood pressure and respiration are known as cardiorespiratory coupling . The instantaneous heart rate can be measured on an ECG recording as the time between beats: the R–R interval. Fluctuation of R–R intervals is a physiological occurrence known as heart rate variability (HRV). HRV and blood pressure fluctuations occur both randomly and rhythmically. Power spectral analysis of these fluctuations shows two significantly correlated rhythmic oscillations indicated by a peak at a frequency around 0.25 Hz (high frequency (HF)) and another at around 0.1 Hz (low frequency (LF)) [49, 50]. The HF oscillations coincide with the typical respiration frequency (i.e. 15 breaths per min, 0.25 Hz) and, hence, are related to the phasic effects of tidal respiration on the cardiovascular system (mechanical, haemodynamic and cardiorespiratory mechanisms), whereas LF oscillations are thought to correspond to cardiac feedback mechanisms that are slower than and independent of respiration [50–52]. The baroreceptor reflex (baroreflex) is a negative feedback mechanism involving stretch receptors, present primarily in the aortic arch and carotid sinuses, that monitor arterial blood pressure and respond to acute changes via central–neural–autonomic pathways, which we will discuss in more depth in later sections. Briefly, arterial baroreceptors are activated by an increase in blood pressure and fire signals via afferent nerves to the cardiovascular centre in the medulla oblongata, which relays fast parasympathetic efferent signals via the vagus nerve to the sinoatrial (SA) node to decrease heart rate, while sympathetic efferent signals relayed via the sympathetic chain in the thoracic spinal column to the heart and blood vessels are suppressed, adding to decreased heart rate, cardiac output and vasomotor tone (reviewed by Wehrein and Joyner ). Baroreceptor activity is reduced when blood pressure is low, resulting in the reverse effects. LF oscillations of arterial blood pressure (known as Mayer waves) are thought to represent the sympathetic arm of the baroreflex, which oscillates slower than respiration at 0.1 Hz [51, 54, 55]. The baroreflex is therefore tightly coupled to, perhaps even predominantly accountable for, LF HRV oscillations [51, 56–59]. HF HRV and baroreflex activity are influenced by the phasic effects of respiration, with the rate of respiration modulating the relationship between the HRV and blood pressure oscillations . It has been indicated that slow breathing causes the pulse harmonics of blood flow (i.e. blood pressure oscillations) to synchronise with the rhythm of the heart . Various studies have found that slow breathing increases amplitudes of blood pressure oscillations and HRV, and that this is particularly significant at a respiration rate of 6 breaths per min (0.1 Hz) [21, 61–64]. At 6 breaths per min, the LF HRV oscillations are said to be augmented by respiration [65, 66]. For example, a study in healthy males in which carotid baroreceptors were stimulated by neck suction during paced respiration found that the influence of the arterial baroreflex on the heart rate and blood pressure was enhanced during respiration at 6 breaths per min . Furthermore, studies on the effects of respiratory phase time ratio have reported a tendency for baroreflex sensitivity and HRV amplitude to increase when the inspiration/expiration ratio is 1/1 during slow breathing at 0.1 Hz [67–69]. The rhythmic influence of phasic respiration on HRV is a physiological phenomenon known as respiratory sinus arrhythmia. Respiratory sinus arrhythmia (RSA) is HRV in synchrony with the phases of respiration, whereby R–R intervals are shortened during inspiration and lengthened during expiration [70, 71]. Typically, RSA has a frequency of 0.25 Hz (i.e. respiratory frequency) as reflected in the HF HRV oscillation peak. RSA frequency therefore changes with respiration rate and this is known to result in a shift in the phase difference between respiration and HRV (the heart rate response) and a change in the amplitude of HRV. This was first reported by Angelone and Coulter  in an early continuous recording of RSA in a healthy human, which demonstrated that as the respiration rate was reduced, the phase difference was shortened, until at rate of 4 breaths per min, where HRV and inspiration/expiration were in exact phase; yet it was at 6 breaths per min (0.1 Hz), where the phase difference was at 90°, that maximisation of HRV amplitude was observed. Maximisation of RSA/HRV at around 6 breaths per min has since been confirmed by numerous studies [65, 73, 74]. This indicates cardiorespiratory system resonance and is hence referred to as a “resonant frequency effect” [72, 75]. At 0.1 Hz, RSA also resonates with the LF baroreflex integration frequency and Mayer waves . Further investigations therefore suggest that both HRV (RSA) and baroreflex sensitivity are maximised when respiration is slowed to ∼6 breaths per min (figure 1), though this resonant frequency does vary between individuals [25, 41, 52, 61, 62, 75]. Increasing tidal volume [36, 73, 76] and diaphragmatic breathing  have also been shown to significantly increase RSA, significantly more so at slower respiration rates. Conversely, numerous studies have reported decreased RSA with increasing respiration rate [72, 73, 77]. Maximum HRV is typically observed at about a respiratory frequency of 6 breaths per min (0.1 Hz). Reproduced from  with permission from the publisher. RSA is thought to have a distinct physiological significance, though it has not been fully elucidated. Studies have indicated that one possible function of RSA is to enhance pulmonary gas exchange efficiency by entraining cardiovascular oscillations within the phases of respiration, thereby matching ventilation and perfusion to heart rate and hence pulmonary blood flow, and reducing physiologic dead space [45, 47, 48, 78, 79]. 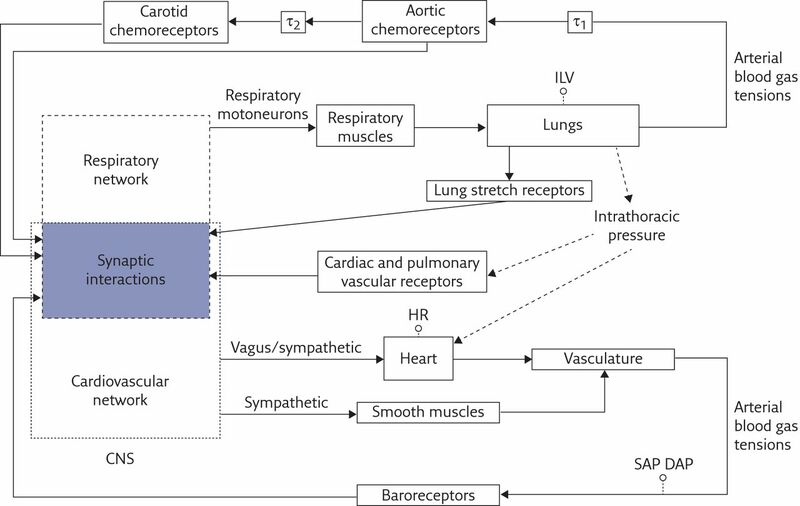 It has been further hypothesised that RSA has an intrinsic role in the resting state of the cardiorespiratory system, as improving pulmonary gas exchange efficiency would minimise energy expenditure, which is supported by the fact that RSA maximises during sleep, relaxation, slow, deep respiration, and when supine, and is reduced during exercise and states of anxiety (reviewed by Hayano and Yasuma ). An alternate hypothesis is that RSA minimises cardiac work while maintaining appropriate blood gas concentrations and that this is emphasised during slow, deep respiration [74, 81]. Studies have also pointed towards a role of RSA in buffering systemic blood flow oscillations resulting from respiratory-driven variations in venous filling and stroke volume of the left heart [29, 35]. The effect that slow breathing has on maximising RSA warrants discussion of its proposed mechanisms. The precise mechanisms underlying RSA have been extensively explored, yet this topic remains relatively unsolved and under intense debate. The debate largely revolves around whether the baroreflex or a central respiratory centre predominantly generates RSA . Settlement of this debate is impeded by the lack of consistency between experimental methods, study population heterogeneity and, hence, a lack of converging results, confounding variables, and the inability to truly determine cause and effect. Nonetheless, it is generally accepted that the genesis of RSA involves a network of central, peripheral and mechanical elements that are likely interacting bidirectionally and contributing synergistically to HRV [36, 38, 83]. The first layer of RSA generation involves mechanical factors such as changes in venous return, stroke volume and cardiac output that are driven by the respiratory swings in intrathoracic/intrapleural pressure, causing heart rate and blood pressure oscillations . The baroreflex is also theorised to drive HRV in response to the respiratory swings in arterial blood pressure [25, 57, 74, 84–86]. Additional peripheral elements known to contribute to RSA include the peripheral chemoreflex , the Bainbridge reflex (atrial stretch receptors that respond to increases in blood volume during inspiration (when venous filling increases) by increasing heart rate [88, 89]) and the Hering–Breuer reflex (slowly adapting pulmonary stretch receptors activated by moderate to excessive lung inflation that invoke increased respiratory drive and heart rate) [71, 90, 91]. Augmentation of these mechanical elements and peripheral reflexes can be achieved by slow, deep breathing, which would contribute to the observed increases in RSA amplitude (reviewed by Billman ). The central theory of RSA revolves around respiratory and cardiovascular centres in the medulla oblongata that converge to generate cardiorespiratory rhythms. The theory implicates a “neural pacemaker”: oscillations of cardiorespiratory neuron activity that generate an intrinsic rhythm that regulates both systems . These pacemaker neurons have been identified within the nucleus tractus solitarius (NTS) and the nucleus ambiguus, oscillations of which are reportedly in phase with respiratory phrenic nerve activity, and which are able to produce an intrinsic cardiorespiratory rhythm that regulates the heart rate via autonomic efferents along the vagus nerve (parasympathetic) and the cardiac sympathetic nerves to the SA node (reviewed by Berntsen et al. ). Whilst this neural pacemaker has an intrinsic rhythm, it is embedded in a complex network of neural pathways and inputs, including those of the mechanical and peripheral reflexes that are received by the neurons in the NTS [70, 90]. The proposal of a “respiratory gate” was an attempt to characterise the autonomic modulation of the heart beat by the cardiorespiratory centres. It was postulated that “inspiratory neurons” in the NTS constitute a gating mechanism, the opening and closing of which is synchronised to the phases of respiration . Closing of the gate coincides with inspiration and pulmonary stretch receptor activation, while opening of the gate coincides with expiration, allowing autonomic efferents relaying activity from peripheral reflexes that accumulate within the NTS to flow into the nucleus ambiguus and be delivered to the heart . This would support respiratory modulation of autonomic outflow as the primary generator of RSA . Simplistically, it can be said that the two arms of the autonomic nervous system exert opposing control over the heart. Cardiac parasympathetic efferents are relayed via the vagus nerve and induce cardiac slowing via acetylcholine release, while sympathetic efferents are relayed via a network of nerves within the sympathetic chain of the thoracic spinal column and accelerate the heart rate via norepinephrine release . Both systems display an intrinsic, tonic rhythm that is generated by a central neural mechanism; however, vagal activity is capable of eliciting a much faster influence on the heart than sympathetic activity, presumably due to faster signal transduction and acetylcholine-receptor kinetics, such that it is capable of delaying the immediate heartbeat and, hence, able to modulate the heart rate at higher frequencies, while cardiac sympathetic influence drops off at ∼0.1 Hz [70, 89, 95]. Furthermore, acetylcholine inhibits noradrenaline release and overshadows noradrenaline at the SA node; hence, parasympathetic activity is said to be the dominant arm of the autonomic nervous system, providing a homeostatic background level of control over the heart rate under resting conditions [95–98]. Sympathetic activity is presumably minimal or absent under resting conditions in healthy humans, whereas it is high in various disease states, and in healthy humans during exercise, and physical and mental perturbations [51, 94]. HRV is therefore largely a product of parasympathetic and sympathetic nervous system activity . HF HRV oscillations are thought to be predominantly parasympathetically mediated, while LF HRV oscillations are thought to be both sympathetically and parasympathetically mediated, depending on the circumstances as mentioned earlier [49, 99]. HRV is therefore regarded as a qualitative index of “sympathovagal balance”, reflecting the weight of parasympathetic versus sympathetic autonomic control, whereby a higher LF/HF HRV ratio reflects sympathetic dominance and a lower ratio reflects parasympathetic dominance [100–102]. Both arms of the autonomic nervous system are under the control of the central respiratory centres, where autonomic drive from the reflex mechanisms and the lung stretch receptors converges. Autonomic outflows are inhibited during inspiration and disinhibited during expiration: the respiratory gate theory [39, 52, 93]. Respiratory phase influence on cardiovagal activity is thought to be far more significant; however, due to a more direct central–neural driving mechanism, and the speed of parasympathetic signal transduction and effect that would allow for heart rate modulation at all respiratory frequencies [70, 89]. Sympathetic bursts do occur when the gate is open during expiration, however, there is a much greater response lag compared to parasympathetic action, and they are also less effective the greater the vagal activity due to suppression of noradrenaline release and effect [39, 95, 96, 98]. Adding to this, the observed correlation between phasic parasympathetic vagal activity (“vagal tone”) with respiratory phase-related HRV oscillations underpins the hypothesis that RSA is largely a vagal phenomenon [71, 103]. Using power spectral analysis corrected for respiratory influence, the effect of respiration rate on autonomic activity can be assessed using LF/HF power and time domain indices . Using this method, Chang et al. reported a shift towards parasympathetic balance and an increase in vagal activity in healthy humans who breathed at 8 breaths per min, as opposed to 12 and 16 breaths per min. Similarly, Zhang et al. performed an investigation in healthy humans breathing at 8 (slow), 12 (average) and 18 (fast) breaths per min using time domain analysis to characterise the respiration response curves of vagal activity. They found that slow breathing augmented vagal power by entraining vagally induced cardiac resetting to the phases of respiration . It has also been shown that during controlled, slow, deep breathing, the respiratory phase modulation of sympathetic activity is stronger, such that more complete inhibition is observed during early inspiration to mid expiration . It has been suggested that in order to achieve a long-term shift towards parasympathetic dominance, prolonged practice of slow breathing is necessary, as was observed in healthy humans who practiced slow breathing regularly for 3 months . Taylor et al. examined the effects of sympathetic blockade on RSA in healthy humans at varying respiration rates (15–3 breaths per min) and found that RSA was enhanced when cardiac sympathetic activity was blocked at all respiratory frequencies. Their results also indicated that tonic vagal activity is constant across respiratory frequencies, to which they speculated that during fast breathing, less acetylcholine is released as expiration is shortened; thus, RSA is reduced. Conversely, whilst at resonant frequency (6 breaths per min), acetylcholine release and hydrolysis is optimised; hence, RSA is maximised. Further to this point, Wang et al. observed a tendency for increased HRV at 6 breaths per min when the inspiration/expiration ratio was 1/1, and based their explanation on optimal acetylcholine release and hydrolysis. Conversely, researchers have postulated that at 6 breaths per min, while sympathetic activity is not necessarily changed, sympathetic bursts may also contribute to HRV, probably due to baroreflex and Mayer wave integration at this respiratory frequency [65, 70]. In the study by Zhang et al. , whilst they observed an increase in vagal power with slow breathing, sympathetic power did not significantly change; however, a change in the pattern of sympathetic bursts within breaths was observed (also reported by Koizumi et al. , Seals et al. and Limberg et al. ). On a similar note, Vidigal et al. conducted an investigation into the effects of slow respiration (6 breaths per min) on autonomic response to postural manoeuvre. Slow breathing improved cardiac sympathetic and parasympathetic responsiveness to physical perturbations, which they suggested may be a result of augmented baroreflex sensitivity due to increased (initial) parasympathetic tone, and synchronisation of sympathetic and parasympathetic systems at 6 breaths per min. Therefore, it is not to be mistaken that slow breathing practice should minimise sympathetic activity, but rather, that it appears capable of achieving optimal sympathovagal balance, and enhancing autonomic reactivity to physical and mental stress. The physiological effects of slow breathing are indeed vast and complex. A simplified model of the respiratory–central nervous system–cardiovascular interaction network is presented in figure 2 . From this review, it can be seen that the breathing pattern, as defined by respiratory rate, tidal volume, diaphragmatic activation, respiratory pauses and passive versus active expiration, has a profound effect not only on respiration efficiency but also extending to cardiovascular function and autonomic function, where the effects are bidirectional. A summary of the major effects of slow breathing (evidenced or theorised) discussed in this review is presented in table 1. Simplified model of cardiorespiratory control showing coupling between respiratory and cardiovascular systems. τ: circulatory delay; ILV: instantaneous lung volume; HR: heart rate; CNS: central nervous system; SAP: systolic arterial pressure; DAP: diastolic arterial pressure. Reproduced from  with permission from the publisher. Variations in respiratory parameters can occur within the normal population in the absence of respiratory diseases; however, traditional medicine has not attempted to define what may constitute optimised respiration within the normal population, and given the profound effect on vagal tone, what constitutes “autonomically optimised respiration”. Perhaps it is time to refine a breathing technique that optimises ventilation, gas exchange and arterial oxygenation, maximises vagal tone, maintains parasympathetic–sympathetic balance and optimises the amount of cardiorespiratory reserve that could be called upon in times of intense physical or mental stress or activity. According to the studies reviewed here, “autonomically optimised respiration” would appear to be in the band of 6–10 breaths per min, with an increased tidal volume that is achieved by diaphragmatic activation. Although not reviewed here, nasal breathing is also considered an important component of optimised respiration [109, 110]. This is easily achievable in most individuals with simple practise and there is yet to appear in the literature any documented adverse effects of respiration in the 6–10 breaths per min range. Controlled, slow breathing appears to be an effective means of maximising HRV and preserving autonomic function, both of which have been associated with decreased mortality in pathological states and longevity in the general population [41, 111–119]. Specific physiological variables have been examined primarily during short-term performance of spontaneous and controlled slow breathing in a controlled environment, while recordings during sustained practice of slow breathing are scarce. Of great scientific interest is the effect of long-term practice of slow breathing. Research could subsequently expand into whether controlled slow breathing can optimise physiological variables in pathological conditions (not limited to the respiratory system). A hierarchy of research will provide a foundation upon which any therapeutic claims can be tested and validated. We thank Anthony Quail (School of Medicine and Public Health, Faculty of Health and Medicine, University of Newcastle, Newcastle, Australia) for reviewing the manuscript and providing invaluable feedback. , et al. Physiology of long pranayamic breathing: neural respiratory elements may provide a mechanism that explains how slow deep breathing shifts the autonomic nervous system. Med Hypotheses 2006; 67: 566–571.
. Sudarshan Kriya yogic breathing in the treatment of stress, anxiety, and depression: part I-neurophysiologic model. J Altern Complement Med 2005; 11: 189–201.
. The Buteyko breathing technique for asthma: a review. Complement Ther Med 2005; 13: 41–46.
. Comparison of the effects of Buteyko and pranayama breathing techniques on quality of life in patients with asthma – a randomized controlled trial. Clin Rehabil 2013; 27: 133–141. , et al. Breathing exercises for children with asthma. Cochrane Database Syst Rev 2016; 4: CD011017. , et al. Breathing exercises for adults with asthma. Cochrane Database Syst Rev 2013: CD001277. , et al. A randomised controlled trial of the Buteyko technique as an adjunct to conventional management of asthma. Respir Med 2008; 102: 726–732. , et al. Effect of two breathing exercises (Buteyko and pranayama) in asthma: a randomised controlled trial. Thorax 2003; 58: 674–679. , et al. Systematic review of the effectiveness of breathing retraining in asthma management. Expert Rev Respir Med 2011; 5: 789–807.
. Anatomy of the normal diaphragm. Thorac Surg Clin 2011; 21: 273–279, ix. , et al. Diaphragm and chest wall: assessment of the inspiratory pump with MR imaging-preliminary observations. Radiology 2000; 215: 574–583.
. Action of the diaphragm on the rib cage. J Appl Physiol 2016; 121: 391–400.
. Transdiaphragmatic Pressure. In: Benito S, Net A, eds. Pulmonary Function in Mechanically Ventilated Patients. Berlin, Springer Berlin Heidelberg, 1991; pp. 52–61.
. Mechanics of the respiratory muscles. Compr Physiol 2011; 1: 1273–1300. , et al. Diaphragm postural function analysis using magnetic resonance imaging. PloS One 2013; 8: e56724. , et al. Analysis of diaphragm movement during tidal breathing and during its activation while breath holding using MRI synchronized with spirometry. Physiol Res 2009; 58: 383–392.
. Diaphragmatic breathing and its effectiveness for the management of motion sickness. Aerosp Med Hum Perform 2015; 86: 452–457.
. Central chemoreceptors: locations and functions. Compr Physiol 2012; 2: 221–254.
. Reflexes arising from the arterial chemoreceptors. Adv Exp Med Biol 1994; 360: 71–86. , et al. Slow breathing reduces chemoreflex response to hypoxia and hypercapnia, and increases baroreflex sensitivity. J Hypertens 2001; 19: 2221–2229.
. Respiratory Rate and Pattern. In: Walker HK, Hall WD, Hurst JW, eds. Clinical Methods: The History, Physical, and Laboratory Examinations. 3rd Edn. Boston, Butterworth-Heinemann Ltd, 1990.
, et al. Effects of slow deep breathing at high altitude on oxygen saturation, pulmonary and systemic hemodynamics. PloS one 2012; 7: e49074. , et al. Effect of breathing rate on oxygen saturation and exercise performance in chronic heart failure. Lancet 1998; 351: 1308–1311. , et al. Modulatory effects of respiration. Auton Neurosci 2001; 90: 47–56.
. Effects of spontaneous ventilation on the circulation. Lung 1981; 159: 175–186.
. Cardiovascular effects of mechanical ventilation. Arch Dis Child 1999; 80: 475–480.
. Respiration-synchronous fluctuations in stroke volume, heart rate and arterial pressure in humans. J Physiol (Lond) 1993; 472: 501–512. , et al. Respiratory effect on the pulse spectrum. J Med Eng Technol 2003; 27: 77–84. , et al. Increased cardio-respiratory coupling evoked by slow deep breathing can persist in normal humans. Respir Physiol Neurobiol 2014; 204: 99–111.
. Anatomic connections of the diaphragm: influence of respiration on the body system. J Multidiscip Healthc 2013; 6: 281–291. , et al. The response of the vena cava to abdominal breathing. J Altern Complement Med 2012; 18: 153–157. , et al. The effect of breathing manner on inferior vena caval diameter. Eur J Echocardiogr 2011; 12: 120–123. , et al. The coupling between peripheral microcirculation and slow breathing. Med Eng Phys 2017; 39: 49–56.
. Respiratory variations in pulmonary and systemic blood flow in healthy humans. Acta Physiol (Oxf) 2012; 205: 341–348. , et al. Effect of breathing pattern on blood pressure and heart rate oscillations in humans. Clin Exp Pharmacol Physiol 1993; 20: 619–626.
. Interactions between respiration and systemic hemodynamics. Part I: basic concepts. Intensive Care Med 2009; 35: 45–54.
. Heart rate variability – a historical perspective. Front Physiol 2011; 2: 86.
. The human respiratory gate. J Physiol (Lond) 2003; 548: 339–352. , et al. Cardiorespiratory coupling: common rhythms in cardiac, sympathetic, and respiratory activities. Prog Brain Res 2014; 209: 191–205. , et al. Effects of slow, controlled breathing on baroreceptor control of heart rate and blood pressure in healthy men. J Hypertens 2004; 22: 1361–1370.
. Effects of slow breathing rate on blood pressure and heart rate variabilities. Int J Cardiol 2013; 169: e6–e8. , et al. Effects of slow and regular breathing exercise on cardiopulmonary coupling and blood pressure. Med Biol Eng Comput 2016; 55: 327–341. , et al. Slow breathing improves arterial baroreflex sensitivity and decreases blood pressure in essential hypertension. Hypertension 2005; 46: 714–718. , et al. Respiratory sinus arrhythmia. A phenomenon improving pulmonary gas exchange and circulatory efficiency. Circulation 1996; 94: 842–847. , et al. Cardio-respiratory interactions and relocation of heartbeats within the respiratory cycle during spontaneous and paced breathing. Physiol Meas 2011; 32: 1389–1401. , et al. Entrainment of blood pressure and heart rate oscillations by periodic breathing. Am J Respir Crit Care Med 1999; 159: 1147–1154.
. Thinking about breathing: Effects on respiratory sinus arrhythmia. Respir Physiol Neurobiol 2016; 223: 28–36.
. Power spectrum analysis of heart rate variability: a tool to explore neural regulatory mechanisms. Br Heart J 1994; 71: 1–2. , et al. Spectral analysis of blood pressure and heart rate variability in evaluating cardiovascular regulation. A critical appraisal. Hypertension 1995; 25: 1276–1286. , et al. Physiology and pathophysiology of heart rate and blood pressure variability in humans: is power spectral analysis largely an index of baroreflex gain? Clin Sci 1995; 88: 103–109. , et al. Respiratory modulation of human autonomic rhythms. Am J Physiol Heart Circ Physiol 2001; 280: H2674–H2688.
. Regulation of blood pressure by the arterial baroreflex and autonomic nervous system. Handb Clin Neurol 2013; 117: 89–102.
. Short-term cardiovascular oscillations in man: measuring and modelling the physiologies. J Physiol (Lond) 2002; 542: 669–683.
. The enigma of Mayer waves: facts and models. Cardiovasc Res 2006; 70: 12–21. , et al. Hemodynamic regulation: investigation by spectral analysis. Am J Physiol 1985; 249: H867–H875. , et al. RR-arterial pressure variability relationships. Auton Neurosci 2001; 90: 57–65. , et al. Baroreflex and oscillation of heart period at 0.1 Hz studied by alpha-blockade and cross-spectral analysis in healthy humans. J Physiol (Lond) 2001; 531: 235–244.
. Arterial baroreflex function and cardiovascular variability: interactions and implications. Am J Physiol Regul Integr Comp Physiol 2002; 283: R815–R826. , et al. Effect of respiratory rate on the relationships between RR interval and systolic blood pressure fluctuations: a frequency-dependent phenomenon. Cardiovasc Res 1998; 38: 332–339. , et al. Correlations between the Poincare plot and conventional heart rate variability parameters assessed during paced breathing. J Physiol Sci 2007; 57: 63–71.
. Influence of breathing frequency on the pattern of respiratory sinus arrhythmia and blood pressure: old questions revisited. Am J Physiol Heart Circ Physiol 2010; 298: H1588–H1599. , et al. Influence of deep breathing exercise on spontaneous respiratory rate and heart rate variability: a randomised controlled trial in healthy subjects. Indian J Physiol Pharmacol 2012; 56: 80–87. , et al. Hemodynamic effects of slow breathing: does the pattern matter beyond the rate? Acta Physiol Hung 2014; 101: 273–281. , et al. Important influence of respiration on human R-R interval power spectra is largely ignored. J Appl Physiol 1993; 75: 2310–2317. , et al. Low-frequency heart rate variability is related to the breath-to-breath variability in the respiratory pattern. Psychophysiology 2014; 51: 197–205. , et al. Effects of respiratory time ratio on heart rate variability and spontaneous baroreflex sensitivity. J Appl Physiol 2013; 115: 1648–1655. , et al. Effects of breathing frequency on baroreflex effectiveness index and spontaneous baroreflex sensitivity derived by sequence analysis. J Hypertens 2012; 30: 2151–2158.
. Breathing at a rate of 5.5 breaths per minute with equal inhalation-to-exhalation ratio increases heart rate variability. Int J Psychophysiol 2014; 91: 206–211.
. Respiratory sinus arrhythmia: autonomic origins, physiological mechanisms, and psychophysiological implications. Psychophysiology 1993; 30: 183–196.
. Respiratory sinus arrhythmia: why does the heartbeat synchronize with respiratory rhythm? Chest 2004; 125: 683–690.
. Respiratory sinus arrhythmia: a frequency dependent phenomenon. J Appl Physiol 1964; 19: 479–482.
. Respiratory sinus arrhythmia in humans: how breathing pattern modulates heart rate. Am J Physiol 1981; 241: H620–H629.
. Central regulation of heart rate and the appearance of respiratory sinus arrhythmia: new insights from mathematical modeling. Math Biosci 2014; 255: 71–82.
. Characteristics of resonance in heart rate variability stimulated by biofeedback. Appl Psychophysiol Biofeedback 2006; 31: 129–142. , et al. Sympathetic restraint of respiratory sinus arrhythmia: implications for vagal-cardiac tone assessment in humans. Am J Physiol Heart Circ Physiol 2001; 280: H2804–H2814.
. Phase relationship between normal human respiration and baroreflex responsiveness. J Physiol (Lond) 1980; 304: 489–502. , et al. Respiratory sinus arrhythmia is associated with efficiency of pulmonary gas exchange in healthy humans. Am J Physiol Heart Circ Physiol 2003; 284: H1585–H1591. , et al. Vagal nerve activity contributes to improve the efficiency of pulmonary gas exchange in hypoxic humans. Exp Physiol 2006; 91: 935–941.
. Hypothesis: respiratory sinus arrhythmia is an intrinsic resting function of cardiopulmonary system. Cardiovasc Res 2003; 58: 1–9.
. Evaluating the physiological significance of respiratory sinus arrhythmia: looking beyond ventilation-perfusion efficiency. J Physiol (Lond) 2012; 590: 1989–2008. , et al. Respiratory sinus arrhythmia in conscious humans during spontaneous respiration. Respir Physiol Neurobiol 2010; 174: 111–118.
. Respiratory sinus arrhythmia, cardiac vagal tone, and respiration: within- and between-individual relations. Psychophysiology 1993; 30: 486–495. , et al. Origin of respiratory sinus arrhythmia in conscious humans. An important role for arterial carotid baroreceptors. Circulation 1997; 95: 1813–1821.
. Hemodynamic fluctuations and baroreflex sensitivity in humans: a beat-to-beat model. Am J Physiol 1987; 253: H680–H689. , et al. Model for the assessment of heart period and arterial pressure variability interactions and of respiration influences. Med Biol Eng Comput 1994; 32: 143–152.
. Contribution of the carotid chemoreceptor reflex to the mechanism of respiratory sinus arrhythmia in young healthy and hypertensive humans. Acta Physiol Pol 1985; 36: 59–64.
. The Bainbridge and the “reverse” Bainbridge reflexes: history, physiology, and clinical relevance. Anesth Analg 2012; 114: 520–532.
. Heart rate variability. Am J Physiol Regul Integr Comp Physiol 2003; 285: R927–R931. , et al. Respiratory sinus arrhythmia in humans: an obligatory role for vagal feedback from the lungs. J Appl Physiol 1995; 78: 638–645. , et al. RR interval-respiratory signal waveform modeling in human slow paced and spontaneous breathing. Respir Physiol Neurobiol 2014; 203: 51–59.
. Central nervous mechanisms responsible for cardio-respiratory homeostasis. Adv Exp Med Biol 1995; 381: 73–79.
. Proposed respiratory ‘gating’ mechanism for cardiac slowing. Nature 1976; 264: 454–456.
. The sympathetic innervation of the heart: Important new insights. Auton Neurosci 2016; 199: 17–23.
. Sympathetic control of short-term heart rate variability and its pharmacological modulation. Fundam Clin Pharmacol 2007; 21: 337–347.
. Effect of cardiac vagal and sympathetic nerve activity on heart rate in rhythmic fluctuations. J Auton Nerv Syst 1985; 12: 251–259. , et al. Dynamic vagal control of pacemaker activity in the mammalian sinoatrial node. Circ Res 1983; 52: 642–656.
. Advances in Parasympathetic Control of Heart Rate and Cardiac Function. News Physiol Sci 1999; 14: 155–161. , et al. Assessment of autonomic function in humans by heart rate spectral analysis. Am J Physiol 1985; 248: H151–H153. , et al. Cardiovascular neural regulation explored in the frequency domain. Circulation 1991; 84: 482–492. , et al. Power spectral analysis of heart rate and arterial pressure variabilities as a marker of sympatho-vagal interaction in man and conscious dog. Circ Res 1986; 59: 178–193. , et al. Power spectrum analysis of heart rate fluctuation: a quantitative probe of beat-to-beat cardiovascular control. Science 1981; 213: 220–222. , et al. Respiration response curve analysis of heart rate variability. IEEE Trans Biomed Eng 1997; 44: 321–325.
. Influence of lung volume on sympathetic nerve discharge in normal humans. Circ Res 1990; 67: 130–141.
. Effect of short-term practice of breathing exercises on autonomic functions in normal human volunteers. Indian J Med Res 2004; 120: 115–121. , et al. Respiratory influences on muscle sympathetic nerve activity and vascular conductance in the steady state. Am J Physiol Heart Circ Physiol 2013; 304: H1615–H1623. , et al. Slow breathing influences cardiac autonomic responses to postural maneuver: Slow breathing and HRV. Complement Ther Clin Pract 2016; 23: 14–20. , et al. Cardiorespiratory interactions during periodic breathing in awake chronic heart failure patients. Am J Physiol Heart Circ Physiol 2000; 278: H932–H941. , et al. Inhalation of nasally derived nitric oxide modulates pulmonary function in humans. Acta Physiol Scand 1996; 158: 343–347.
. Role of Nitric Oxide in Buffering Short-Term Blood Pressure Fluctuations. News Physiol Sci 2000; 15: 229–233. , et al. Impact of reduced heart rate variability on risk for cardiac events. The Framingham Heart Study. Circulation 1996; 94: 2850–2855. , et al. Prospective study of heart rate variability and mortality in chronic heart failure: results of the United Kingdom heart failure evaluation and assessment of risk trial (UK-heart). Circulation 1998; 98: 1510–1516. , et al. Baroreflex sensitivity and heart rate variability in the identification of patients at risk for life-threatening arrhythmias: implications for clinical trials. Circulation 2001; 103: 2072–2077. , et al. Heart rate, heart rate variability and inflammatory biomarkers among young and healthy adults. Ann Med 2016: 1–26. , et al. Healthy lifestyle and heart rate variability in young adults. Eur J Prev Cardiol 2016; 23: 1037–1044. , et al. Heart rate variability and myocardial infarction: systematic literature review and metanalysis. Eur Rev Med Pharmacol Sci 2009; 13: 299–307. , et al. Relation of high heart rate variability to healthy longevity. Am J Cardiol 2010; 105: 1181–1185.
. The relationship between mental and physical health: insights from the study of heart rate variability. Int J Psychophysiol 2013; 89: 288–296.
. The role of vagal function in the risk for cardiovascular disease and mortality. Biol Psychol 2007; 74: 224–242.